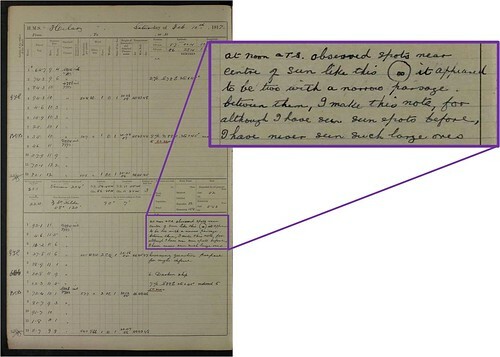 Over on our sister site, the Old Weather team are digitising ship’s logs from first world war Royal Navy vessels in order to capture the valuable meteorological information that the fleet collected. These records also contain information that can be surprisingly useful for a whole host of other reasons. One such example was identified by HebesDad and brought to our attention over at Solar Stormwatch by Caro. This is an unusual sighting and, if observed with the naked eye, (something you should never try to do as you risk damaging your eyes) the spots must have been very large indeed. I consulted my colleagues at the UK Solar System Data Centre at the Rutherford Appleton Laboratory and they were able to confirm that this observation was indeed correct. Photographs taken from the Dehra Dun observatory show quite clearly that on that day, and on the days leading up to the 10th, a large sunspot group was indeed observed almost exactly as the observer on H.M.S. Hilary described. My colleague Dr David Willis, an expert on historical sunspot observations, informs me that the accepted limit above which sunspots can be seen with the naked eye is taken to be when a sunspot exceeds an area of 500 millionths of the Sun’s visible hemisphere. On my screen, the Sun has a diameter of 220mm while the spots are around 10 mm. Using the formula for the area of a circle (3.14 x [radius squared]), I estimate that the area of each of these spots is around 6195 millionths of the total area of the Sun. These sunspots are clearly above the threshold to be viewed with the naked eye! David also provided information from the Greenwich observatory publication “Sunspots and Geomagnetic-Storm Data Derived From Greenwich Observations 1874-1954” (HM Stationary Office, 1955). In a list of the 55 greatest sunspots in the interval 1874-1954 this sunspot group (number 7977) recorded the 8th largest maximum area. The reason we are so interested in observation of sunspots is that these regions are closely linked with solar mass ejections – vast eruptions of material from the Sun’s atmosphere. If one of these eruptions comes towards Earth, it can generate spectacular auroral displays, disturb the Earth’s magnetic field – leading to anomalous compass bearings, deplete the ionosphere (the electrically charged layers in the Earth’s upper atmosphere) – leading to disruption of radio communications, and cause surges of electricity along any long cables such as power and communications networks. 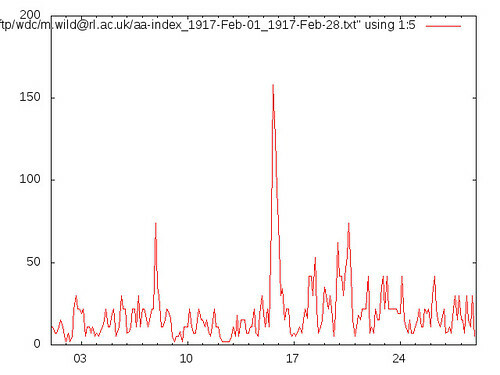 Matthew Wild at the UKSSDC generated a plot of the aa index for February 1917. The aa index is a measure of the variability in Earth’s magnetic field. This index compares the measurements made by two magnetic observatories on opposite sides of the World in the UK and Australia. Measurements started in 1868. Originally the UK measurements were made at Kew in London but they are now made at Hartland in the UK while the Australian measurements are made in Canberra. Large values of aa represent a disturbed magnetic field. Looking at the aa index for February 1917 we can see that the values around the 10th were not particularly high but that on the 15th February, aa levels increased from around 20 to over 150! It is likely that this is a result of the Earth being hit by a solar storm launched from this enormous sunspot group. It is difficult to say how big or fast this storm was since we have no record of when it was launched but these storms travel at speeds between 400 and 2000 km per second, reaching Earth in 1-3 days. It would be interesting to see if any ships reported erratic compass bearings during this time as the cloud of solar material buffeted the Earth’s magnetic field in space. Variable magnetic fields set up electrical currents that heat the Earth’s upper atmosphere, depleting the ionisation there. As a consequence, wireless operators, using the ionosphere to reflect their wireless signals around the world, would also have noticed a weakened signal strengths in the days that followed the arrival of the solar storm at Earth. The Greenwich publication noted a ‘small’ geomagnetic storm on the 15th and rather curiously relates it to the much smaller sunspot group number 7990 though there seems to be no conclusive proof of this. So, there you have it. A rare observation of a large sunspot group visible with the naked eye recorded with precision by a diligent observer who presumably knew the potential impact that such an observation could have to both the ship’s navigation and radio communication (if it was equipped with such modern technology). If you are interested in finding out more about the Sun and solar storms feel free to join us over at solar stormwatch where you can even help predict the arrival of solar storms at Earth. Meanwhile please keep us posted on any sightings of aurora, sunspots, erratic compass needles or poor wireless reception. They are all clues about the activity of the Sun in a time long before spaceflight. My thanks to Matthew, Sarah and David at the Rutherford Appleton Laboratory for helping to piece this story together. If you would like more information about the UK Solar System Data Centre and the records it contains, visit http://www.ukssdc.ac.uk. Solar images are under Crown Copyright. What a wonderful piece of research to join up all these threads! The log keeper could never have imagined that all these years on his simple drawing would be so interesting. Is it possible for others of us to find out about large sunspots – I recall a set of substantial spots in about June 1978 – very visible as the sun set and very disruptive to radio. If it’s helpful to the story at all, the British Geological Survey has also been digitising magnetic records. We now have a collection of magnetograms and magnetic observatory yearbooks online. We have data from three magnetic observatories that were operating in the UK in 1917 – Greenwich, Kew and Stonyhurst. We hope that by digitising these records scientists may better understand past magnetic storms to help us prepare for future space weather events.